In the 2016 AFL Season, Michael Willson turned his lens on players, clubs, fans,and matches in every state of Australia. He was in the middle of the ritual of the song, he was there in tender moments when players celebrated milestones with their kids, he was there when fans cheered, and when they wailed. The photography of sport has advanced enormously in recent years, with the development of superior lens and fast equipment, but it is only the expertise and experience of the photographer that can capture that moment: the high mark, the pain, the joy, the despair. The AFL game is not easy to photograph, with its wide expanses, large numbers of players, and blistering speed. Michael Willson, AFL Media’s senior photographer, brings his love of the game to each match he photographs. Born and raised in Swan Hill, a Sherrin (and camera) were never far from his hands. Growing up playing football with Lake Boga FC - including the famous 2003 drought breaking premiership—fostered a deep and lasting passion for the game. Since the 2005 AFL season he has earned the respect and trust of players and clubs alike, creatively photographing all the action, triumph, heartbreak, blood, sweat and tears— often capturing moments otherwise unseen—from a unique perspective that can only come from an intimate knowledge and love for photography and Australian Football. This book, his first, will include more than 80 photographs of the season, from the torture and hope of the pre-season through to the apex of the Grand Final, split into the Chapters that describe the game and its players better than any words could do. 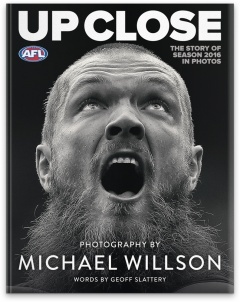 Up Close, a Slattery Media Publication, under licence from the AFL, will be published in October, at an RRP of $34.95. Geoff Slattery is a successful journalist and author with more than 40 years' experience in publishing. In 1995 he founded The Slattery Media Group, which up until 2012, was the official publisher for The AFL.